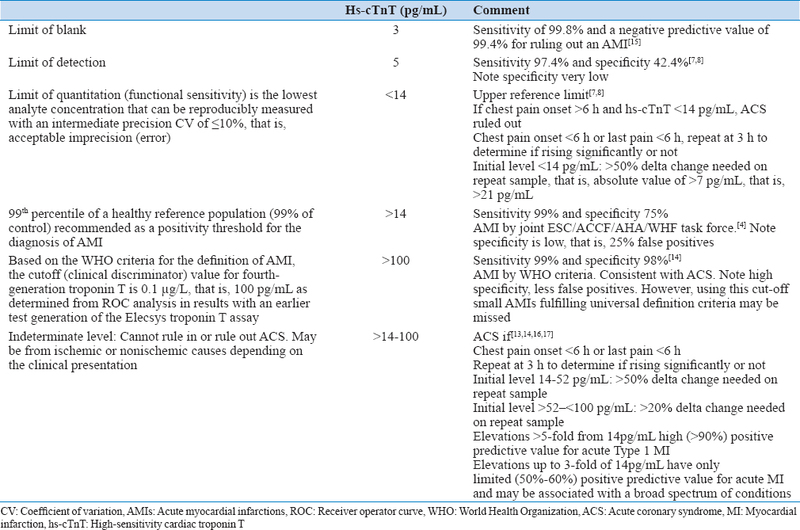 High-sensitivity cardiac troponin T (hs-cTnT) is widely used in Oman and other Gulf countries. The availability of newer generation hs-cTnT has increased the sensitivity of diagnosing non-ST-elevation acute coronary syndrome (ACS). They utilize same antibodies as fourth-generation assay but can measure 10-fold lower levels of cTnT. Any detectable level above the 99th percentile of population suggests myocardial damage. However, the cause could be non-ACS. Therefore, the increase in sensitivity of hs-cTnT assays for ACS comes at the cost of a reduced ACS specificity because more patients with other causes of myocardial injury are detected than with previous cTnT assays. Hence, there is large confusion among emergency physicians regarding optimal cutoff values to definitely confirm non-ST-elevation ACS, especially in patients with low likelihood of ACS. This review summarizes the available clinical and biochemical data to make recommendations about hs-cTnT cutoff values which will guide physicians to take decision in patients presenting with low likelihood ACS. Troponins are cardiac intramuscular proteins that are involved in the calcium-mediated interaction of proteins actin and myosin resulting in muscle contraction., Troponin complex consists of 3 subunits, troponin T, which binds to a protein called tropomyosin which initiates interaction between actin and myosin in the muscle sarcomere leading to contractions. Troponin I binds to actin resulting in inhibition of actin/myosin interaction. Troponin C binds the calcium ions initiating tropomyosin action. Skeletal and cardiac isoforms of Troponin T (cTnT) and Troponin I (cTnI) have amino acid sequence which are quite dissimilar (but not totally dissimilar) which can be detectable by monoclonal antibody assay. Cardiac and smooth muscle troponin C isoforms have similar sequence amino acids, hence cannot be measured separately., cTnI is specific to cardiac tissue. When myocyte are damaged, the cell membrane may degrade and release troponin in blood or when injured may leak due to increased membrane permeability. High-sensitive cTnI and cTnT levels (hs-cTnT) raise within 1 hour of cardiac injury and remain increased for 7–14 days after myocardial infarction (MI). cTnT and cTnI are frequently ordered in the emergency department (ED) as chest pain consists of the majority of ED visits in a shift. The appropriate interpretation of elevated troponin is important in determining correct diagnosis of acute coronary syndrome (ACS) as well as need for admission, percutaneous coronary intervention, or antithrombotic therapy. However, the etiology of raised troponin may be other than atherosclerotic plaque rupture with thrombosis (Type I MI). It is very important to rule out or rule in ACS as under diagnosis may lead to missing ACS or overdiagnosis may unnecessarily prolong ED stay as well as admissions and interventions. With the advent of newer generation hs-cTnT assay, the sensitivity has markedly increased to near 100%, but specificity has come down in view of increase of troponin in non-ACS causes. The important downside of these highly sensitive troponin assays is an unfortunate increase in “false-positive” results, due to conditions which may stress the heart but are not actually related to an acute ischemic event. In Oman and other Gulf countries, most of the hospitals use hs-cTnT. Currently, there is confusion among the user in ED regarding interpretation of hs-cTnT, especially in patients with low likelihood of ACS, with ED physicians and cardiologists interpreting in different ways. Hence, there is a need of a clear-cut document based on existing evidence to interpret hs-cTnT in low likelihood of ACS patients. Thus, this review was prepared to make all physicians understand about hs-cTnT and its interpretation. Hs-cTnT and cTnI are measured by immunoassay methods. Hs-cTnT analyzer is manufactured by single company (Roche Diagnostics, Inc.), whereas multiple companies make cTnI analyzers. According to the product insert, “the Elecsys Troponin T high-sensitive assay (Roche Diagnostics, Inc.) fulfills the guidelines of the American College of Cardiology/European Society of Cardiology and National Academy of Clinical Biochemistry/Academy of the American Association for Clinical chemistry in achieving <10% coefficient of variation at the 99th percentile upper reference limit of the reference population.” It is a fully automated test with results within 9 min, 99th percentile upper reference limit of 14 ng/L (pg/mL), limit of detection 5 ng/L (pg/mL), and limit of blank at 3 ng/L (pg/mL). According to package insert, “the optimal cutoff for the diagnosis of acute MI by troponin T was previously calculated by ROC analysis at 0.1 μg/L, that is, 100 pg/mL with an earlier test generation of the Elecsys Troponin T assay.” The sensitivity and specificity for using 100 pg/mL cutoff value in hs-cTnT assay results in a sensitivity of 99% and specificity of 99% in diagnosing MI. 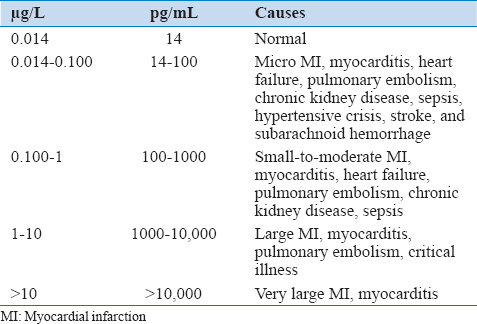 However, the sensitivity for diagnosing MI calculated at the 99th percentile of 14 pg/mL increases to 100%, but the specificity drops to 75%, that is, 25% false-positive results. In a meta-analyses reported in BMJ which included 20 studies (23 papers), at 14 pg/mL cutoff value for hs-cTnT, sensitivity and specificity were 89% and 77%, respectively. Majority of chest pain patients presenting to ED have no significant electrocardiogram (ECG) changes and no history of past coronary artery disease. Picking up patients who truly have ACS within this “low likelihood” category is challenging. There are many risk score assessment models used in ACS, such as the PURSUIT, TIMI, GRACE, FRISC, and HEART risk scores. However, none of these risk scores applies to ED chest pain evaluation except for the new HEART score, but none is practically applied in actual day-to-day busy clinical practice. ED physicians just tend to forget to apply these scores, unless a written protocol is attached to each case and data entered. Hs-cTnT is widely used in Oman and other countries. The availability of newer generation hs-cTnT has increased the sensitivity of diagnosing non-ST-elevation ACS but at the cost of a reduced ACS specificity. Understanding of the hs-cTnT cutoff values and the delta change needed to diagnose ACS, has diagnostic and therapeutic implications in the ED leading to a rapid diagnosis of low likelihood ACS patients as well as avoiding unnecessary admissions and interventions. Thygesen K, Mair J, Katus H, Plebani M, Venge P, Collinson P, et al. Recommendations for the use of cardiac troponin measurement in acute cardiac care. Eur Heart J 2010;31:2197-204. Newby LK, Jesse RL, Babb JD, Christenson RH, De Fer TM, Diamond GA, et al. ACCF 2012 expert consensus document on practical clinical considerations in the interpretation of troponin elevations: A report of the American College of Cardiology Foundation Task Force on Clinical Expert Consensus Documents. J Am Coll Cardiol 2012;60:2427-63. Morrow DA, Cannon CP, Jesse RL, Newby LK, Ravkilde J, Storrow AB, et al. National Academy of Clinical Biochemistry Laboratory Medicine Practice Guidelines: Clinical characteristics and utilization of biochemical markers in acute coronary syndromes. Clin Chem 2007;53:552-74. Thygesen K, Alpert JS, Jaffe AS, Simoons ML, Chaitman BR, White HD, et al. Third universal definition of myocardial infarction. Eur Heart J 2012;33:2551-67. Franeková J, Bláha M, Bělohoubek J, Kotrbatá M, Sečník P Jr., Kubíčk Z, et al. Aclinical and laboratory approach used to elucidate discordant results of high-sensitivity troponin T and troponin I. Clin Chim Acta 2015;446:128-31. Vafaie M, Biener M, Mueller M, Schnabel PA, André F, Steen H, et al. Analytically false or true positive elevations of high sensitivity cardiac troponin: A systematic approach. Heart 2014;100:508-14. Available from: http://www.cobas.com/home/product/clinical-and-immunochemistry-testing/elecsys-troponin-t-hs-tnt-hs.html. [Last accessed on 2018 Jan 07]. Zhelev Z, Hyde C, Youngman E, Rogers M, Fleming S, Slade T, et al. Diagnostic accuracy of single baseline measurement of Elecsys troponin T high-sensitive assay for diagnosis of acute myocardial infarction in emergency department: Systematic review and meta-analysis. BMJ 2015;350:h15. Backus BE, Six AJ, Kelder JH, Gibler WB, Moll FL, Doevendans PA, et al. Risk scores for patients with chest pain: Evaluation in the emergency department. Curr Cardiol Rev 2011;7:2-8. Amsterdam EA, Kirk JD, Bluemke DA, Diercks D, Farkouh ME, Garvey JL, et al. Testing of low-risk patients presenting to the emergency department with chest pain: A scientific statement from the American Heart Association. Circulation 2010;122:1756-76. Luepker RV, Apple FS, Christenson RH, Crow RS, Fortmann SP, Goff D, et al. Case definitions for acute coronary heart disease in epidemiology and clinical research studies: A statement from the AHA Council on Epidemiology and Prevention; AHA Statistics Committee; World Heart Federation Council on Epidemiology and Prevention; the European Society of Cardiology Working Group on Epidemiology and Prevention; Centers for Disease Control and Prevention; and the National Heart, Lung, and Blood Institute. Circulation 2003;108:2543-9. Twerenbold R, Jaffe A, Reichlin T, Reiter M, Mueller C. High-sensitive troponin T measurements: What do we gain and what are the challenges? Eur Heart J 2012;33:579-86. Thygesen K, Mair J, Giannitsis E, Mueller C, Lindahl B, Blankenberg S, et al. How to use high-sensitivity cardiac troponins in acute cardiac care. Eur Heart J 2012;33:2252-7. Roffi M, Patrono C, Collet JP, Mueller C, Valgimigli M, Andreotti F, et al. 2015 ESC guidelines for the management of acute coronary syndromes in patients presenting without persistent ST-segment elevation: Task Force for the Management of Acute Coronary Syndromes in Patients Presenting without Persistent ST-segment Elevation of the European Society of Cardiology (ESC). Eur Heart J 2016;37:267-315. Body R, Carley S, McDowell G, Jaffe AS, France M, Cruickshank K, et al. Rapid exclusion of acute myocardial infarction in patients with undetectable troponin using a high-sensitivity assay. J Am Coll Cardiol 2011;58:1332-9. Delport R, Ker JA. Measurement of cardiac troponins to detect myocardial infarction using high-sensitivity assays: South African guidelines. Cardiovasc J Afr 2012;23:531-2. White HD. Higher sensitivity troponin levels in the community: What do they mean and how will the diagnosis of myocardial infarction be made? Am Heart J 2010;159:933-6.